Oh, boy! Need to buy for a guy? Phew! They can be so hard to shop for - am I right?! I thought I'd share some gift ideas for your guy today... or for your dad, brother, grandfather, etc. Everyone is different so there are all sorts of categories you can shop. The outdoorsman, the nerd (I say that with love... Justin's a nerd hehe), the fashionable man, the traveler, the gamer, the laid back guy, and the guy who likes to have a good time. So many choices for so many different personalities! 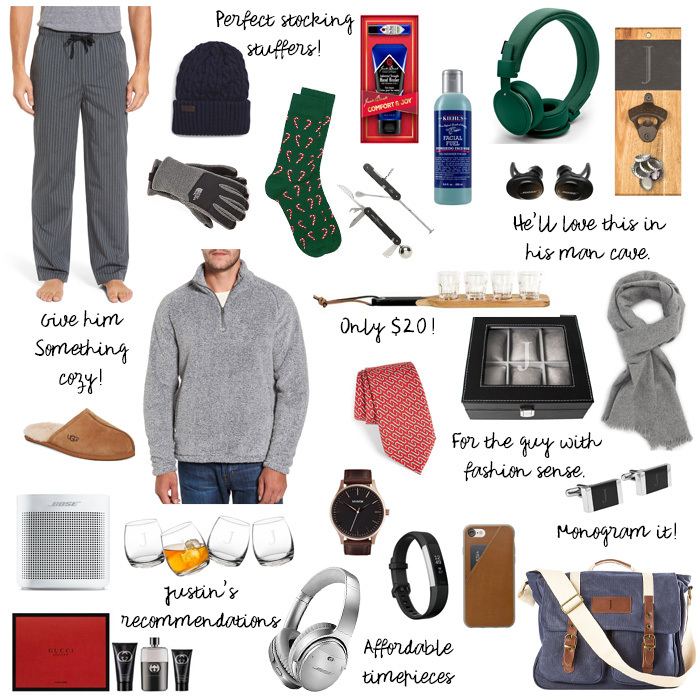 In today's post, you'll find a mix of items for all sorts of guys. I even included Justin's picks in the bottom left corner. The Bose Headphones are pricey but he talks about how much he loves them all the time. They are wireless and noise canceling... and cushioned so they are even comfortable to sleep in on flights. Justin is a cologne connoisseur so I chose my personal favorite, Gucci Guilty. They also make a female version that is fabulous. In addition, you'll find the Bose Portable Speaker. - I got one for J a while back and we love it for playing music through the house from our phones. One of my favorite items is the monogrammed watch box. I keep Justin's watches on a bracelet holder I got from Target, but the box would be great for keeping in a closet or out on a dresser where his timepieces won't be exposed to air and tarnish. A great way to show them off! And to go with, you can give your guy some personalized cuff links. I love the black and silver because they are so versatile, and chic if I do say so myself. At the top of the collage, you'll find some stocking stuffer ideas as well. Stockings are my favorite part of Christmas and Justin and I decided we are only doing stockings this year because of the big move and all our expenses. Which is fine by me because they are so much fun! It's a great opportunity to use your creativity. I love the idea of a lotion, cleanser, socks, undies, Starbucks gift cards, and even a coffee mug. I also like wrapping each item individually, no matter how small, so it's more fun to open. I hope this was helpful and don't forget you can still enter to win the holiday necklace below!